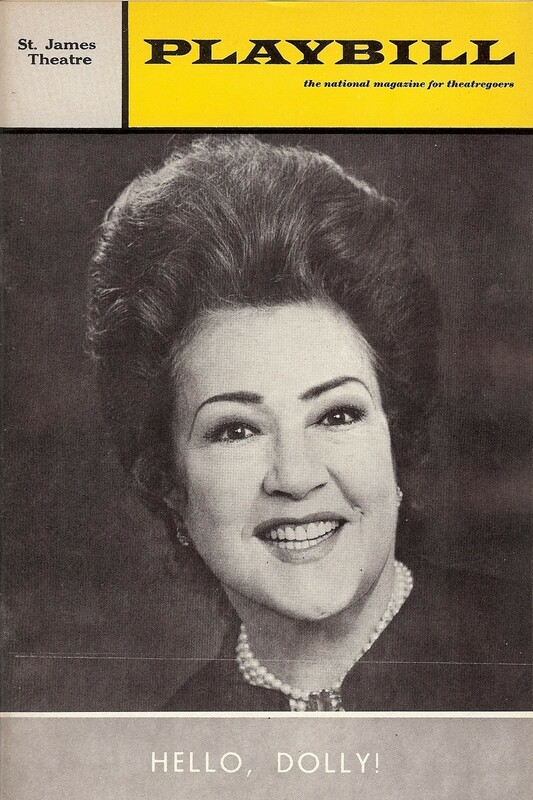 The Ethel Merman Dolly dynasty reigned from March 28, 1970 – December 27, 1970. On November 30th, The New York Times announced that she was closing on December 26–then, the Sunday matinee was added! The role of Dolly Levi in the musical was originally written for Ethel Merman, but Merman turned it down; as did Mary Martin (although both eventually played it). Merrick then decided to audition Nancy Walker. Eventually, he hired Carol Channing, who ultimately created Dolly her signature role. Director Gower Champion was not the producer’s first choice, as Hal Prince and others (among them Jerome Robbins and Joe Layton) all turned down the job of directing the musical. 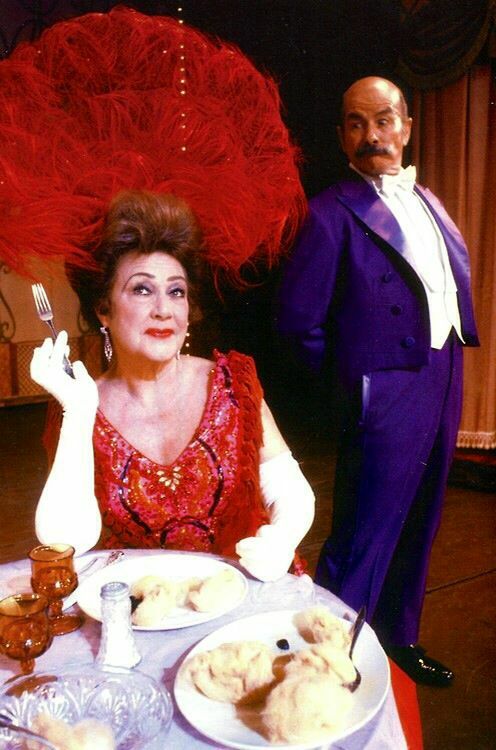 Merman retired from Broadway in 1970, when she appeared as the last Dolly Levi in Hello, Dolly! In Brian Kellow’s biography of Ethel Merman, A Life, he states that Herman made a study of all of Merman’s recordings, concluding that the role of Dolly was perfectly tailored to her talents. Herman was in Merrick’s office the day the producer made the call pitching the show to Ethel. Jerry saw Merrick go completely ashen. When Merrick hung up, he told Jerry that Merman said she would never do another Broadway show because she had spent her life in dressing rooms. She was tired of doing Broadway and wanted to focus on film and television. If Merrick thought he could persuade her, he was wrong. Ethel never regretted her decision. In late 1968 and 1969, Ethel concentrated on television appearances, with guest shots on The Hollywood Palace, The Carol Burnett Show, and several of the then popular talk shows. Try as she might to persuade the press and the public that she had “had it” with Broadway, Ethel’s level of activity in the late 1960s was not sufficient to keep her fully engaged; she had too much vitality, too much drive, and she needed a more demanding outlet than the occasional guest spot on television. In Howard Kissel’s biography of David Merrick, David Merrick – The Abominable Showman: The Unauthorized Biography(Applause Books), he states that Ethel’s original concerns about not wanting to be compared with Ruth Gordon, creator of the role of Dolly in Thornton Wilder’s The Matchmaker, now seemed a moot point. When Carol Channing left the show in August 1965, a long line of actresses had come in as replacements: Ginger Rogers, Martha Raye, Betty Grable, Pearl Bailey, and Phyllis Diller. All had something individual to bring to the part, and Merrick reveled in the publicity value that came from announcing the next star to assume the role. Josh Ellis, a theatrical press agent for thirty years during which he represented over 100 shows and numerous individuals, was at Ethel Merman’s opening night on March 30th, 1969. That night, local New York television critic Stewart Klein offered: “Ethel Merman in HELLO, DOLLY! 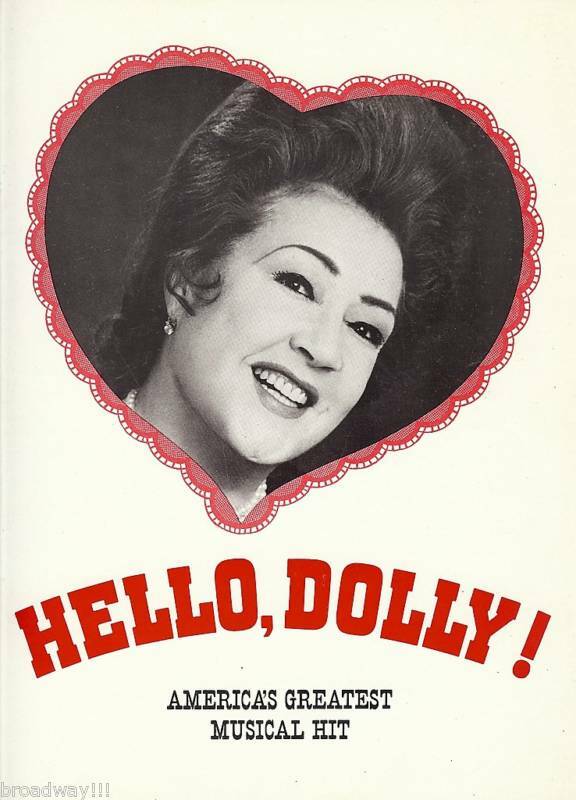 is a marvel and should be seen by everybody.” The role of Dolly Levi was originally written for Ethel Merman. Josh said that night was the most enthusiastic audience that ever, ever, ever was! The cart rolled in, the newspaper was up, and the audience was screaming because they knew who was behind the newspaper. When she put the newspaper down, the audience was on its feet cheering and would not let her talk for two minutes. She finally got out the first part of “Doll…” and they cheered even more. She got a standing ovation after World, Take Me Back. She got another standing ovation after Before the Parade Passes By. It was breathless. Everything worked that night. 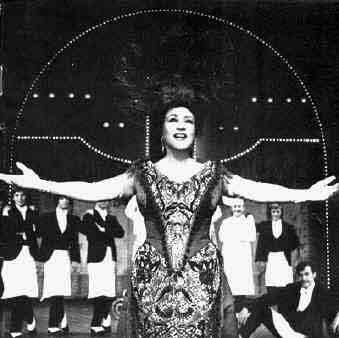 For the title number, the curtain at the top of the stairs revealed Ethel Merman and the entire audience stands up. The number continues but the audience does not sit down. When she sang her solos, she sang solo. When the chorus came back in, the entire audience sang along with them. When the “waiters” put their hands behind them and swayed with her, so did the entire audience. When Ethel sang, the audience shut up and listened; they knew when to join in. By the time the show was over, the audience was drenched. On top of the two additional songs that were put back in for Ethel, because of the audience’s enthusiasm, the show went an additional seven minutes. There was no question in Josh’s mind that everyone in that audience had already seen Hello, Dolly! at least once prior to that night; probably many times before, and everyone loved it. The fact that everyone was hearing two songs they had never heard before sung by Ethel superseded any other quibbles that anyone may have had. It didn’t matter. It was such an overwhelming experience that nothing else really mattered except that it was a night to remember that would last your whole life; and that’s exactly what it did. Josh’s account is verified in Brian Kellow’s biography of Ethel Merman, A Life. Merman ended the original run of Dolly on December 27th, 1970. It had played 2,844 performances.